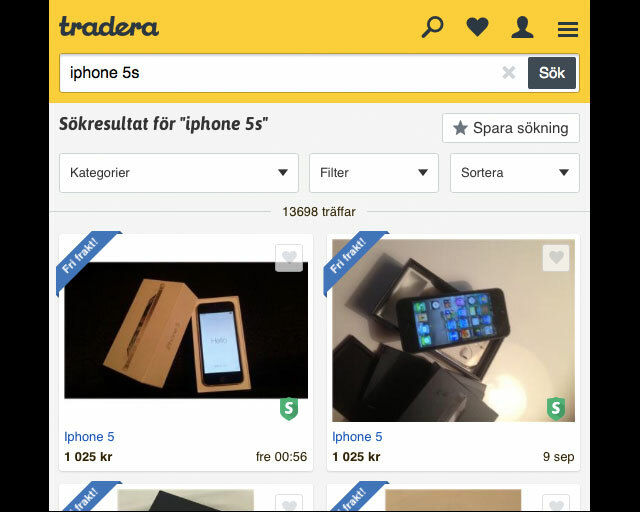 Tradera, a Swedish online marketplace for auctions and retail, wanted to launch a buyer and seller protection program and needed to formulate the right messaging. I drove the research and design for this project. 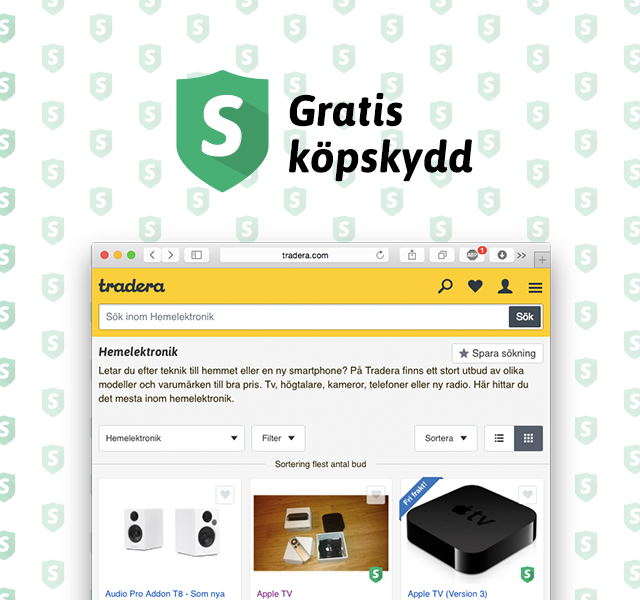 Tradera wanted to add more protections for buyers and sellers, so we partnered with Klarna, a payment startup that offers many payment options and buyer/seller protection. Combined with traceable shipping from DB Schenker, we could now offer door-to-door protection. This was set to become a major part of our brand, being a lynch pin of marketing to win customers and encourage current ones to buy and sell more items of higher value. Due to circumstances, we had a very short time frame to ship it, so we had to think and move quickly. I first sketched out rough mockups of all the places this feature could be seen in an end-to-end experience. I then ran them by every stakeholder for their gut reactions. The idea was to get everyone thinking about this feature as early as possible, when it was most open to change, so they could start estimating – or coming up with better ideas. I researched how other brands handled buyer protection. Although there are many ways to illustrate security, most lend themselves to a specific usage. (For example, a lock denotes SSL connections for secure banking.) A shield is often used for consumer protection, so we ran with it. I mocked up a placement image with our initial project name (Tryggare Tradera, or ‘Safer Tradera’), then contracted the final visual design of the logo to our go-to agency, S+Z Design. We iterated on the logo in parallel with the further research on naming. Variations. First, I engaged our Product Marketing Manager to work up 5-6 possible slogans. These included a few of our best shots, as well as two ‘negative hypotheses’ to double-check ideas that might have misleading or negative connotations. Prototypes. 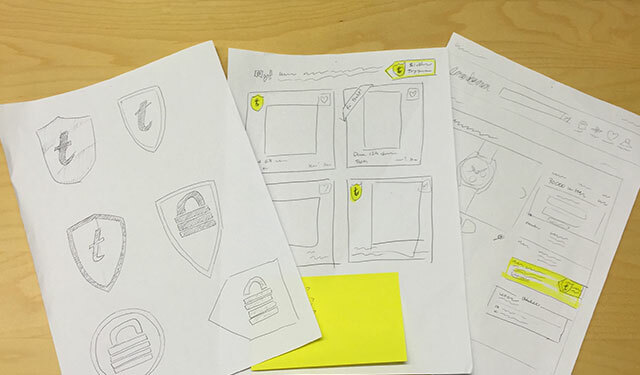 Next, I then mocked up paper prototypes containing the logo candidates in a variety of different applications, each designed to gauge reactions at touch points in the experience. Kick-off. We recruited ten Tradera employees across a range of domains to interview ~5 people each. I ran through the guide, demonstrated techniques to handle difficult situations, and scheduled the follow-up. Recruiting a broad, cross-functional group of Tradera employees to do customer interviews demonstrated the value of this research quickly and convincingly. Follow-up. As we shared our experiences, people drew parallels to their own interviews. Halfway around the table, the patterns were clear. By the end, the correct choice - 'Buyer protection' (Köpskydd) - was obvious. A-ha moments. Everyone had at least one surprising customer perspective. For example, a journalist told our CEO which names lent themselves best to article headlines. Another pointed out a feature name that would have put us on the hook for responsibilities we never intended. Empathy. Every person in the room had made a personal connection with customers. The stakeholders all had the benefit of hearing the qualitative responses of over 30 customers, and were able to follow up with further questions. Shared vision. Everyone was now also equipped to be a good collaborator from that point on. Everyone producing content had a group of people that could provide informed critique. And, since everyone had a shared perspective, the decision making process ran smoothly. Product refinements. It seems Swedish sellers don’t feel the need for extra protection for several of reasons, so we cut ‘Seller protection’ entirely. Most other companies charge for this feature, so we specifically called out 'Free' (Gratis). Implementation. For buyers, we call out buyer protection on search results, product pages. For sellers, we emphasize the benefits of offering buyer protection for items being offered in expensive categories. Brand new sellers are forced to offer it in some categories. Strong reception. 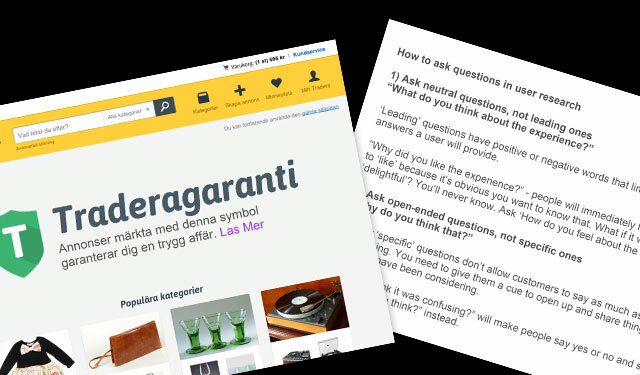 Adoption is high, new customers feel better about selling on Tradera (even if they didn't use the feature), sellers offer the feature on the items we anticipated, and customers spend more and are happier about their purchases. Process adoption. Product Marketing was so impressed, they adopted the exact same testing methodology for another project one month later. Senior leadership also decided to build time for this type of customer feedback into estimates for future content-heavy initiatives.